Earlier today, Stephanie and I went to another Mariners game. 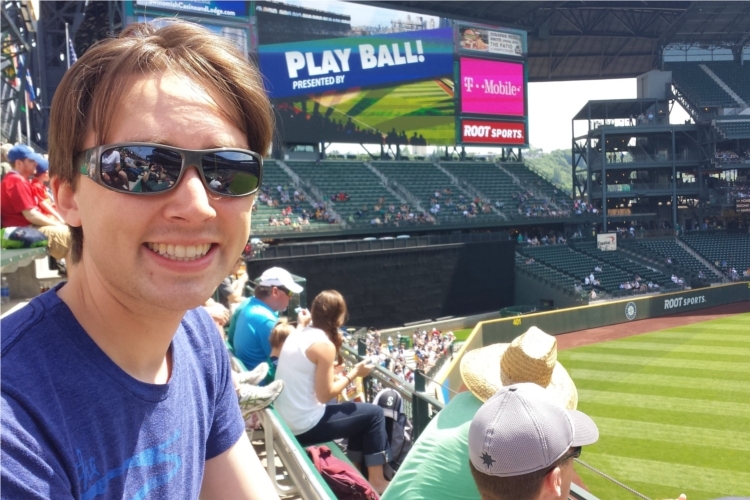 The weather has been amazing in Seattle this week (75-83 °F and super sunny), and I was able to find some very cheap seats on StubHub; we figured it’d be imprudent not to buy tickets. The game started at 12:40 pm and it was actually a little roasty-toasty sitting on the aluminum bleachers which were directly in the sun. Thankfully, there was a pretty persistent breeze coming in off the water so it wasn’t uncomfortably hot. Play ball! 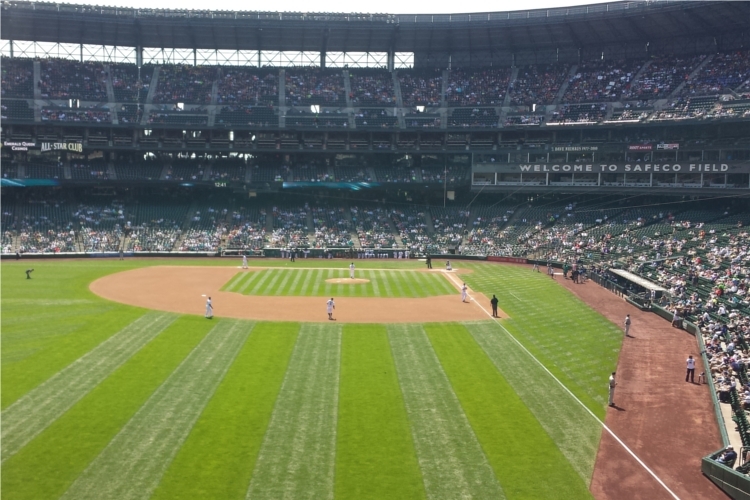 A sunny, breezy day at Safeco Field. For lunch, we went to the “The Natural” concession stand where they serve a variety of vegetarian entrées. Stephanie got their veggie burger (which she rated as “meh”), and I got the veggie chilli dog. I’m not sure what kind of non-meats were used to make the hot dog, but it was nicely spiced and had a good texture. And the chilli that they dumped on top was thick and well-seasoned and had carrots and corn and chickpeas and kidney beans and lots of other veggies mixed in. On top of this, I piled a bunch of mustard and ketchup and sauerkraut. It was super messy. Unfortunately, I neglected to take a picture of my hot dog before I snarfed it down. Or maybe that’s not really so unfortunate? I suppose a chilli dog probably isn’t the most photogenic type of dog… in any case, it was delicious! And filling. I would definitely get one again. Our view from the left field bleachers. Unfortunately, the baseball-related performance of the Mariners was nowhere near as good as the lunchtime-related performance of my chilli dog. Seattle managed exactly two hits. They did not score any runs, losing 2-0. If it hadn’t been so nice out this would have been a fairly miserable baseball game. Oh well. There are certainly worse ways to spend an afternoon!